Cast: Lee Seo Jin, Cho Jae Hyun, Oh Yeon Soo, Song Ji Hyo, Cha In Pyo, Hyo Min, Lee Hyun Woo and No Young Hak. Due to the Queen being of Silla blood, an elite group of assassins try to kill her and the Crown Prince Ui Ja on a regular basis. 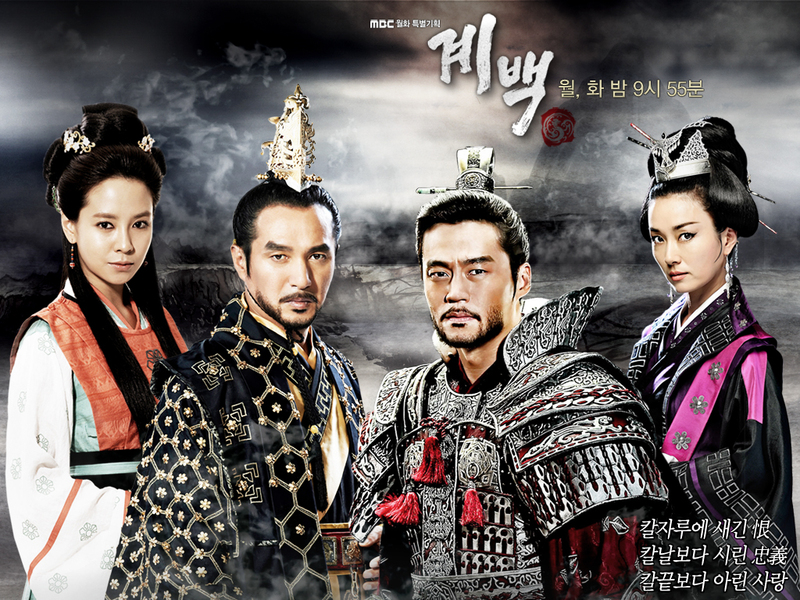 This has prompted the King of Baekje to assign his most loyal and skilled swordsman Moo Jin (Cha In Pyo) to guard them. But due to unforeseen events, the Queen dies to save her son, and Moo Jins wife dies while giving birth to a son, Gye Baek. Several years later, Gye Baek (Lee Hyun Woo) now a youngster, works odd jobs, so he can take care of his drunk father. Here he meets merchant-in-training Eun Ko (Park Eun Bin), whom he immediately falls for. Moo Jin, who has lost his arm, has remarried, so the past is unknown, and Gye Baek believes his stepmother and stepbrother, are his real mother and brother. Though mourning, Moo Jin meets the Crown Prince Ui Ja (No Young Hak) again, now a regular Prince due to the new Queens (Oh Yeon Soo) son taking that title and sees right through his pretense, about not caring about the past. Yeah, I know this is very detailed, and yes, I did spoil a bit, but I tried to stay off the details, so if you decide to watch it, you will get several surprises and you will notice the details I left out. Out of all the historical dramas out there, this one is the first one where I was in awe of the quality of the costumes - like the first 10 min seemed extremely well. I don’t now much about the uniforms of Baekje, but I know that the armor was iron, and it kind of looked like iron. In most dramas I can see that they are made of plastic (or whatever it is) but I didn’t in this one - at least not in the beginning. Also, it might be because I had the first episode in HD quality (I think 1080p), that might have something to do with it too. What I mean is, it was nice to see that there exist good costumes out there, like realistic ones anyways. This is also one of my first dramas where the lead actors are over 30 years old, as they (directors, or whoever casts these actors) usually have young actors doing quality and popular dramas. And they were all ‘veteran’ actors, with skill, which was extremely nice to see. I have to admit, I was amazed by Song Ji Hyo. I never knew she could act mean or evil - she can officially do both. I liked her in this, and she is very good at acting. Though I noticed that she was tired (haha, blaming RM for that). The rest were good too. The lacking thing in this one is both pace and extreme character development, which I couldn’t really comprehend. Though the fact that these developments are the reason the story end as it did. But all in all, an alright drama that made me emotional, and confused at the same time.